This game is recommended primarily for fans of the Generation 1 Transformers cartoon/franchise. Although they have made some updates that include content from other more recent versions of the franchise. The content updates are fairly frequent, which would suggest this game is intended to be a long term success. It is a real time strategy based game, in which the objective is to collect several Autobot and/or Decepticon teams to gather resources from the opposing faction to build your base up. Some of the base upgrades can improve the teams in use. There is a story component, at certain points in gameplay, there will be scripted cutscenes with dialogue from the characters. The game is specifically designed for long term gameplay, so it is advisable to start as soon as possible if someone is interested in playing. It's not required to spend every day playing, just that it takes a while in time to perform certain tasks. The game is based on Alliances and teamwork. An Alliance is a group of 40 players who work together to meet collective event goals to acquire specific unlocks that benefit the individual members. These events are scheduled for weekends, presumably because the company is aware that it would not be practical to do this during the working week. A good Alliance has a ladder family. A new member will join the lowest ladder and when their performance increases, they get to move up to a higher rung of the ladder. It is recommended to signup for the email newsletter, because there are free giveaways occasionally via the email. The game is primarily built around collecting ingame Transformers to build up teams. It is not recommended to use ingame transactions to purchase team members, because they have a low reward/unlock rate. This is the kind of game that can be played for free, with time, patience and the right Alliance. When first starting the game, you are asked to choose a faction to play, Autobot or Decepticon. The choice made will limit you to specific Alliances and Combiner. However, if you choose Autobot, you will also be allowed to deploy Decepticon teams, you just won't be able to have access to their Combiner. I play Autobot primary, so if anyone is possibly interested in joining my Alliance ladder one day, it's best to start as an Autobot player. The empty spaces in the last two teams are because I haven't gotten a suitable character unlock to fill that space yet. 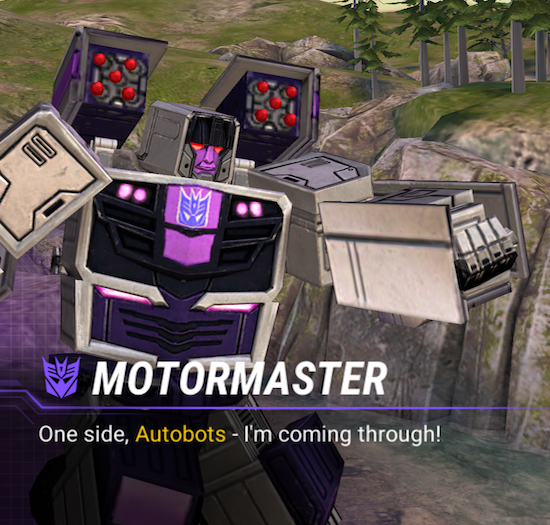 For Autobot Primary players, there's a reasonably lengthy delay to acquire new Decepticons, so it will be a fair while until Motormaster is available for me to include in Team Stunticon. The character quality is defined by star rating, the more they have, the more powerful they are. Eventually, the goal is to have teams that are only 4* and higher quality. 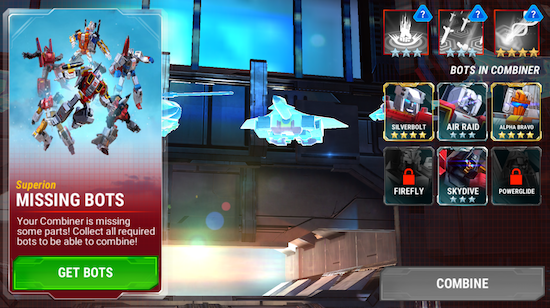 This also affects Combiners, acquisition of 3* characters is specifically required for a Combiner. If all the Combiner components are 4*, then the resulting Combiner will become more powerful.